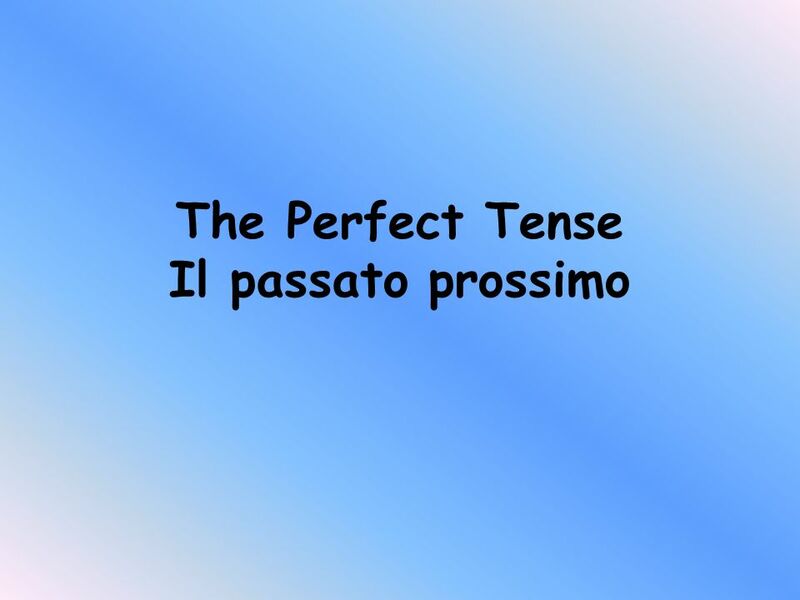 The Perfect Tense Il passato prossimo Look at the following 3 sentences. Ali played football yesterday They have visited Paris 3 times We did eat pizza. 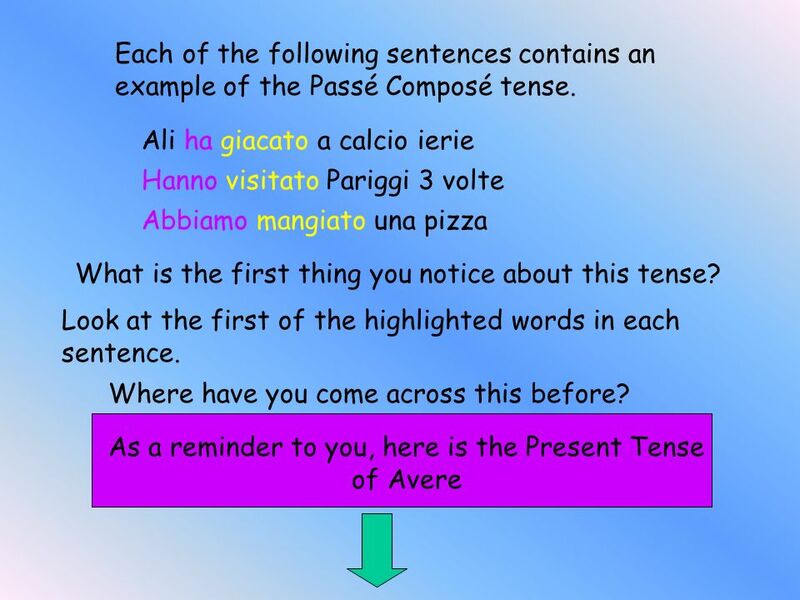 Download ppt "The Perfect Tense Il passato prossimo Look at the following 3 sentences. 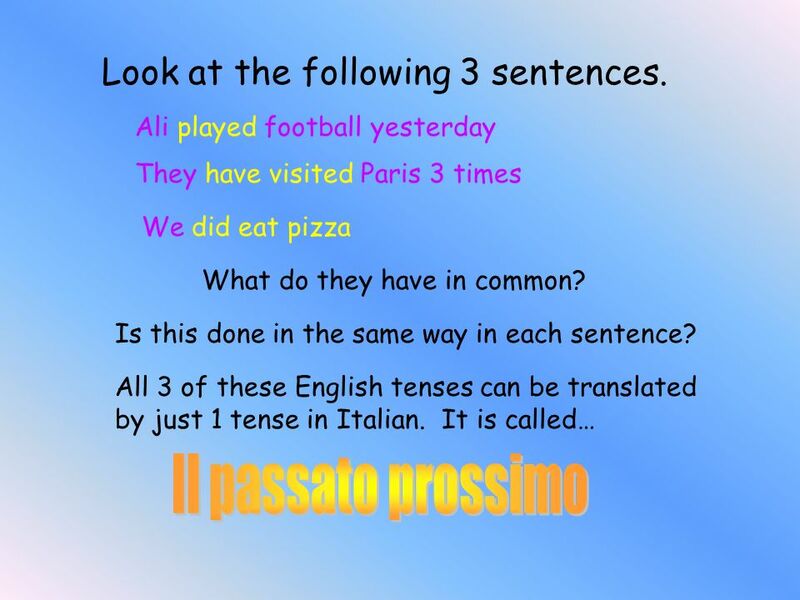 Ali played football yesterday They have visited Paris 3 times We did eat pizza." 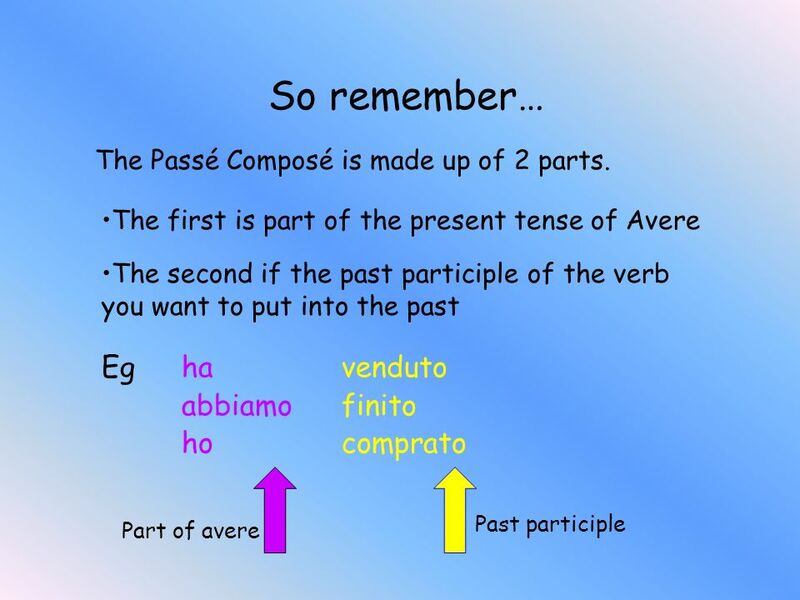 The Passé Composé of –er verbs. Le Passé Composé Part II - ir/ re verbs. 3.1 © and ® 2011 Vista Higher Learning, Inc The passato prossimo with avere and essere Use the passato prossimo to express an action completed in. 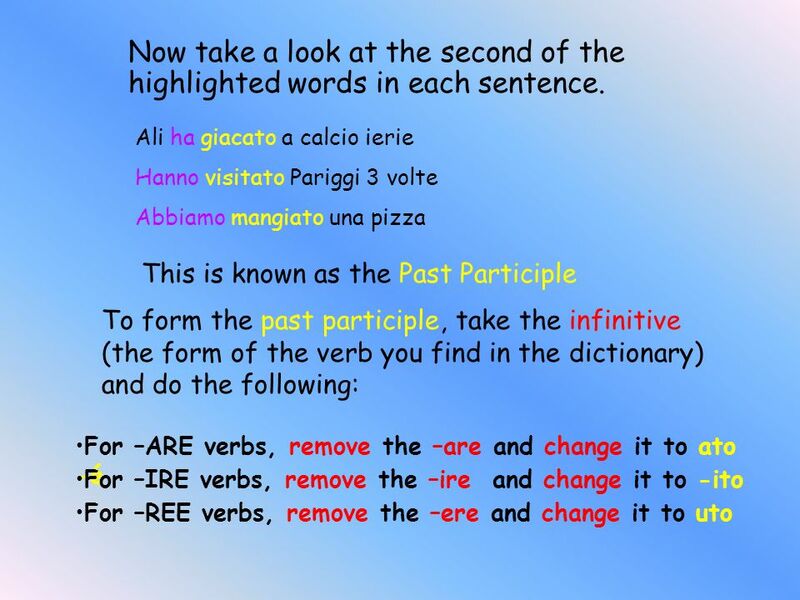 Passato Prossimo of Irregular Verbs Page 168 By: Stella Froliklong Partners with: Carla and Giada. 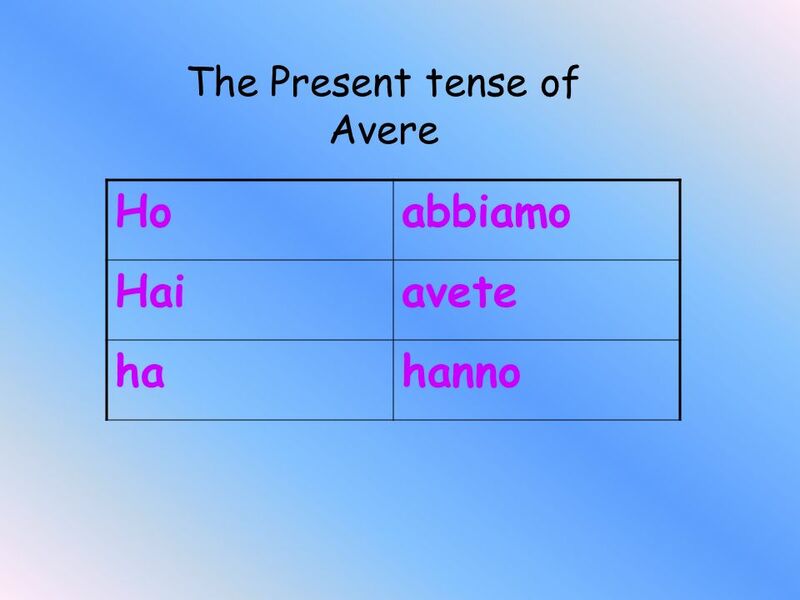 Il verbo avere The verb to have. Avere (To have) Io hoNoi abbiamo Tu haiVoi avete Lei,lei,lui haLoro,loro hanno. Il Passato Prosimo Giada, Stella, Carla. 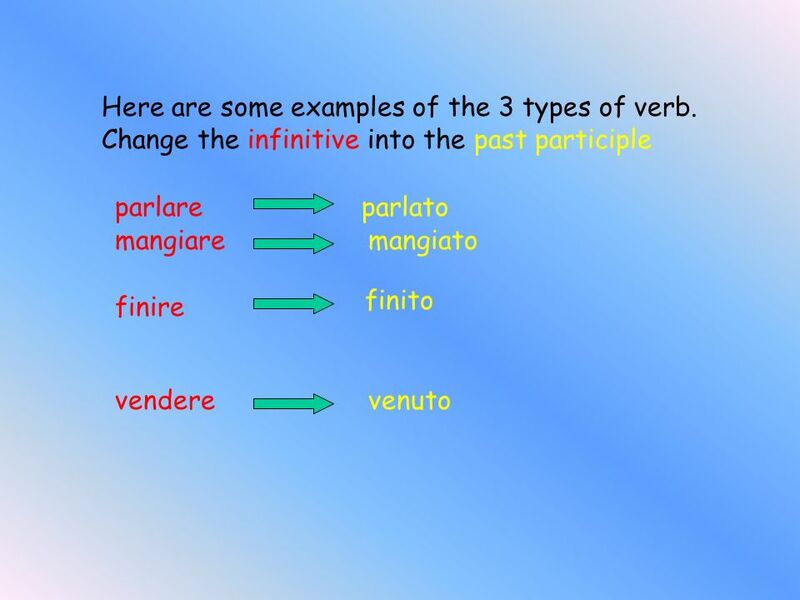 Forming Il passato prossimo There are two parts that you need in order to form the past participle. There are. You guys used to travel every summer every summer She was dancing They used to study. We were laughing. When I was little, I used to sing to sing. Le Passé Composé. Sometimes in English we use an expression of time and another verb to show that we are talking about the PAST. Le passé composé (the perfect tense). The perfect tense – Le passé composé In French you use the perfect tense (le passé composé) to say what you have. Le Passé Composé avec Avoir. Objective You will be able to form the passé composé of regular –er, -re, and –ir verbs that use avoir.